While the rest of the world was going crazy talking about how James Cameron has changed the future of moviemaking, Martin Scorsese was showing us once again why he is the greatest living director, by doing what he does better than anyone: mining the cinema’s past and coming up with something far more valuable than Avatar’s “unobtainium.” Shutter Island, based on the novel by Dennis Lehane, is intricately spun from the golden age of film noir and Hitchcockian mysteries by a team of master technicians. They are guided by Scorsese and his new leading man, Leonardo DiCaprio, but each and every player brings considerable skill and craftsmanship to this twisting psychological thriller. The setting is Boston Harbor in 1954, and the mood is established in the opening frame. 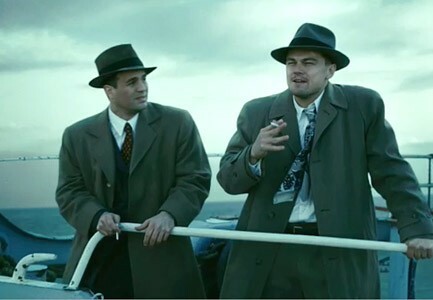 DiCaprio’s federal marshal Teddy Daniels and his new partner, Chuck Aule (Mark Ruffalo), are on their way to the eponymous island, where they have been sent to investigate the mysterious disappearance of a mental hospital patient. The rear-projection sky surrounding their ferry is the first visual cue that something isn’t quite right. Anyone unfamiliar with Scorsese’s love and intimate knowledge of movie history might mistake this technique for a low-budget shortcut, but it’s far more likely to be an homage to ‘50s-era filmmaking. The atmosphere is made all the more disturbing by ominous music that seems better suited to a climax than an exposition. Again, the director’s sure hand and proven skill indicate that something lurks beneath the surface of this unsettling choice. The genius of this film is in its unusual choices, many of which seem simplistic or stock until the final plot twist reveals them to be veiled indicators of the story’s (and the movie’s) direction. As the doctor in charge of the asylum, Ben Kingsley is almost too typical an academic. He wears a bow tie, smokes a pipe, and speaks with clipped erudition. In the hands of a lesser actor, the character might be a caricature, but Kingsley is unmatched in his ability to convey finely-calibrated menace. On the surface, his Dr. Cawley is a type that we’ve seen many times before; credit Kingsley’s mastery of tone for the way that Cawley seems wholly fresh and original. Ruffalo, too, is tasked with playing a standard cinematic character, the cop-detective sidekick/partner — another role that could easily become distractingly conventional. But Ruffalo never fails to endow his characters with intelligence and believability, and he allows Chuck to serve the same function for the audience that he does for Teddy: reassurance. His portrayal is perfectly authentic to its type and yet fully realized, even likeable. If cinema is going to have a future, this is the kind of 3-D performance that should populate it. Throughout Shutter Island’s 138 minutes, Scorsese reminds us that the most impressive imagery is created when the special effects flow from story and character, rather than the other way around. The story of Teddy’s past becomes intertwined with the events on the island through a series of hallucinations and nightmares. True to form, Scorsese pulls color from the palettes of the other masters, primarily Kubrick and Lynch, to create beautifully filmed visions of horror. The work of his long-time editor Thelma Schoonmaker evokes the mental rhythm of dreams, where images can suddenly shift and terrify. The visuals are so arresting, you almost don’t notice the equally perfect aural effects that accompany them. And yet none of the technical finesse in these sequences pulls focus from the superb acting. For his part, DiCaprio gives the kind of finely wrought performance that audiences can confidently expect from his collaborations with Scorsese. The arc of his character’s development is wider, perhaps, than that of any role DiCaprio has previously played, and he is equally believable portraying the character both in and out of control. Teddy’s surreal visions culminate in a devastating scene in which both DiCaprio and Michelle Williams (in the role of Teddy’s departed wife Dolores) make their case for next year’s Academy Awards nominations. Williams in particular, whose work has grown from strength to strength in recent years, is utterly chilling. Although all the characterizations are easy to believe, the story itself asks much in the way of suspending disbelief. As with most films where nothing is what it seems, the twist at the end reveals an elaborate construct that could happen “only in the movies.” But Scorsese has assembled the pieces with such precision that simply watching them move is marvelous. The result is motion picture that will stand the test of time.